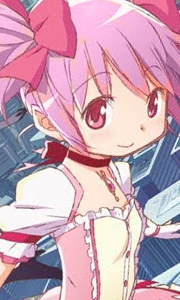 Madoka Kaname is an average 14-year-old girl who loves her family and friends. One fateful day, this all changes when she has a very magical encounter with a strange creature called a Kyubey. Kyubey have the power to grant one wish to chosen girls. However, in exchange, those chosen must become magical girls and use their powers to fight against witches, evil creatures born from darkness and catalysts of despair. Was this encounter by c..
Madoka Kaname is an eighth-grader who leads a peaceful, fun-filled life as a student, surrounded by her beloved family and her best friends. One day, a transfer student named Homura Akemi arrives in Madoka's class. She is a dark-haired beauty with a somewhat mysterious disposition. Soon after meeting Madoka for the first time, Homura goes on to issue Madoka a strange warning. Madoka also meets Kyubey, a mysterious looking white creature.. The young girls have discovered the truth... the cruel fate of a magical girl. Madoka's best friend, Sayaka Miki's Soul Gem turns pitch-black as its owner falls into despair and it is transformed into a Grief Seed. Upon seeing this fate, Kyoko tries to save Sayaka, and ends up sacrificing her own life. One magical girl after another is destroyed. Throughout it all, there is one magical girl who continues to fight alone - Homura Akemi. A..
What does it really mean to be a magical girl? Madoka Kaname is an average 14-year-old girl who loves her family and friends. One fateful day, this all changes when she has a very magical encounter with a strange creature called a Kyubey. Kyubey have the power to grant one wish to chosen girls. However, in exchange, those chosen must become magical girls and use their powers to fight against witches, evil creatures born from darkness an..
Own Puella Magi Madoka Magica - The Movie Part 1 - Beginnings DVD from Deff, DVD, Blu-Ray & 4K Video Specialists - Free UK Delivery..
Own Puella Magi Madoka Magica - The Movie Part 2 - Eternal DVD from Deff, DVD, Blu-Ray & 4K Video Specialists - Free UK Delivery..
Own Puella Magi Madoka Magica - The Movie Part 3 - Rebellion DVD from Deff, DVD, Blu-Ray & 4K Video Specialists - Free UK Delivery..
Own Puella Magi Madoka Magica - The Movies Part 1 & Part 2 - Beginnings / Eternal Blu-Ray from Deff, DVD, Blu-Ray & 4K Video Specialists - Free UK Delivery..